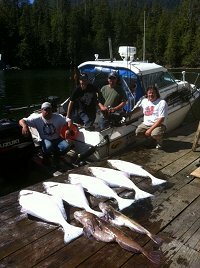 6th August, 2011: FISHING REPORT: Port Alberni Inlet, Barkley Sound, Ucluelet (West Coast), Somas-Stamp River System. The summer months are quickly moving by and the salmon fishing in many areas of Vancouver Island just seems to be getting better and better as we move into early August. The salmon fishing in Barkley Sound and the West Coast off of the Ucluelet Harbor for Chinook, Coho, and Pink Salmon has been extremely good. Unfortuately the Port Alberni Sockeye fishing for natural or mother nature reasons has not been what it should have been. The Chinook and Coho on the surf line and the various banks are getting bigger by the week. Most of these salmon continue to be migratory salmon moving to destinations or watersheds well to the south. We are expecting some of the salmon returning to nearby rivers, streams, and creeks of the Pacific Rim and Alberni Valley regions to appear by the second week of August. This should in fact develop into an even a much stronger sport fishery. August and the early part of September should have fascinating sport fishing out on the coast and also most of Barkley Sound. 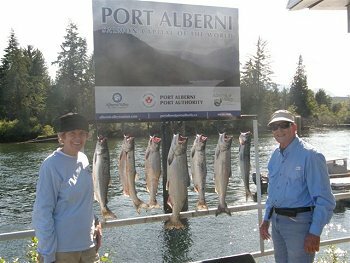 The Port Alberni Inlet should have a good return of Chinook and Coho and usually by the 15th of August good numbers of these Chinook begin to show in Inlet areas close to China Creek and the Port Alberni Harbor. The sport fishing in the Port Alberni Inlet unfortunately has been almost non existent since the 12th of July. The sockeye return forecast still holds at 1.4 million which is a fantastic run and return but because of the huge winter snow pack in nearby mountain ranges which drain into the Somass system and also the very unusual cool spring and summer the Sockeye salmon filled both Sproat and Great Central Lakes with approximately 400,000 fish very early. The DFO responded with this fast return to the Somass system and the two lakes by opening a full Alberni Inlet gill and seine net Sockeye commercial fishery which completely decimated the sport fishery. DFO was concerned about the salmon survival in the two lakes with the huge early returns and is the basic reason why the Inlet to as far as the Bamfield Harbor mouth was scattered with gill nets. The Chinook return to the Somass system should begin with salmon showing in good numbers in Inlet areas by the 15th of August. Pre season forecasts are showing appoximately 50,000 Chinook returning to the terminal area of Barkley Sound and the Inlet. Most of these fish will be returning to the Robertson Creek Hatchery. Approximately 32,500 spawners will be needed meaning that there will be 18,000 Chinook available for harvest. The age class of this years return is 8% three year olds, 81% four year olds and 11% five year olds. With this in mind there should be a good number of Chinook in the twenty to twenty-five pound class. Coho numbers are expected to be above average. Coho returns to the Pacific Rim and the many creeks and stream tributaries of the Somass system through conservation have become very strong over the past decade. We should see Somass-Stamp River Coho begin to show in Barkley Sound close to the end of August and peak during the second week of September before moving into the inlet. Parts of Barkley Sound have been incredible through June and July and the first few days of August. Swale Rock, Village Reef, Vernon Bay and Pill Point have been on and off with Swale Rock being the most consistent. 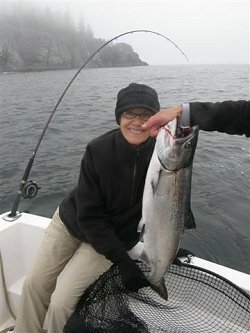 Meares or Effingham Island has been very good for the sport fishery with good Chinook, Coho, and Pink Salmon fishing. The salmon have been out in the deep water on the low tide and often on the flood move in towards the rocks and feed on the huge quantities of rich resourced bait fish. Chinook have been in 80 to 120 feet of water and have been averaging from the mid teens to mid twenties in terms of weight. The Coho have been in twety-five to eighty feet of water and are gorging themselves putting on a pound a week and are currently averaging eight to ten pounds. Most of the salmon continue to be migratory fish moving to watersheds to the south. We are expecting the local salmon to begin to show relatively soon. This is not to say that some Somass Chinook and Coho have not already arrived as there are some fairly early returns to the Somass system over the past ten days. When fishing the waters of Barkley Sound it is ideal if sport fishermen have some anchovy on board. To this date anchovy has not been essential as the salmon have been hitting various coyote spoons and hootchies behind glow and kinetic flashers. In Coyote spoons, silver glow, lime green, green and blue nickel, watermelon, and cop car have all been working. The various whites (AORL12) and greens and blues in hootchies have had some great success over the past two weeks. Anchovy should have at least a six foot leader and the army truck, purple haze, UV green and bloody nose Rhys Davis Teaser Head have all been working well. A few sport fishermen are using a variety of six inch plugs and tomic spoons with or without flashers. These have been working only when the bait fish are big in size. We are expecting Barkley Sound to have some continued great salmon fishing. With the late summer run of migratory salmon and local salmon returning to their natural streams and creeks their should be some continued terriffic fishing right into mid September in all of Barkley Sound for Coho and Chinook salmon. Areas right outside the Ucluelet Harbor and as far as the Big Bank or shallows and up to Portland Point which is close to Tofino have all had rather phenomenal sport fishing from the late spring right up until now. The lighthouse bank, inner and outer south bank and the turtle head have all been sensational for Chinook and good sized coho. Most of the banks have had plenty of bait fish and with the migration of salmon they have have been feeding heavily in these many favorite offshore Ucluelet areas. When bait fish are in the different areas during the summer months the sport fishing is normally extraordinary. The inner and outer south bank and the turtle head have seen most sport fishermen fishing in the fifty foot level down to almost the sandy bottom at 135 to 150 feet. Hootchies, coyote spoons, and a variety of five and six inch tomic plugs and spoons seem to all be working relatively well. Some sport fishermen are using bait and having great success but like Barkley Sound bait has not been essential. Over the past week the Chinook salmon have been getting bigger as there are many more in the mid thirties being landed by guests on our charter boats. Sport fishermen in their privately owned boats have also been landing some bigger fish. 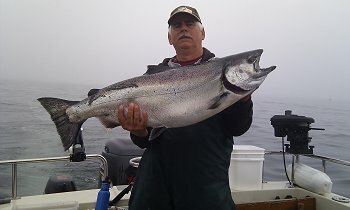 The Coho offshore are also getting up and over the ten pound mark with a few fish in the low to mid teens being landed. August and September are really exciting months to be on the water. These are the two months that bigger Chinook and Coho begin to arrive along the west coast of Vancouver Island, B.C. as they have been spending weeks during their long migration feeding constantly on bait fish. 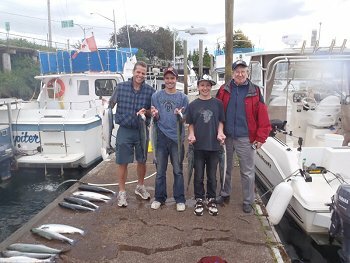 The saltwater sport fishing in 2011 has been fantastic on the surf line and offshore west coast Vancouver Island locations. We are really expecting the inshore areas of Barkley Sound to pick up as well as the Port Alberni Inlet by mid August. If you are thinking of a fishing trip, this is the year and August and the early part of September is the time to come. The Stamp River September and October salmon and summer steelhead fishing should be unbelievable again this fall. Coho returns are looking extremely good with Chinook returns being average. For those that enjoy flyfishing the 10th of october right through until mid November is often the best time. Space for guided trips in the river during the fall is very limited so organize early so there are no disappointments. Good fishing to all and be safe..